I bought a movie for $1. I’d been looking for this movie for months. Remembering that it was an “award” winning movie back in 1999, The Insider starring AL Pacino and Russell Crowe; somehow had become a 2nd rate movie. I scratched my head. (I do this a lot 🙂 ), as I always do when asking, “what’s changed?”. I was able to finally finish the movie (thank you techy Hubby) in parts and pieces late this evening. This movie contains one of the last great stories of News reporting and investigating of my generation and I believe, the buck will stop there. In these last days, great truth telling news and investigative reporting has been reduced to documentaries that get pushed down the media “slaughterhouse”. The major news networks don’t remember. Don’t recall. And more important; don’t have an audience to support the fame of truth telling to promote it anymore. It grieves me. It grieves God. BUT. It had been prophecied that this is how it will be. Once again, proving the Word of God, tried, tested, and true. I sit here tonight… wondering…pondering…praying. A dear sister in the Lord and my Aunt just got called up to Adonai’s lap. I know she had so many questions, left this life with an anxious soul because the truth confused her rather than comforted. Though she loves Yeshua (Jesus) with all her heart, and her heart bore much fruit as a result, I can testify. Much freedom of the truth Yeshua spoke of was not realized for her “this side of heaven”. It’s undeniable to her now!!! It’s fully realized for her now. I praise God for His faithfulness. For that, in the end will be the only thing praise- worthy…the only thing. I also praise Him because of the process and the journey that somehow He knows is nesassary for us all – this moving between awestruck wonder of Him and total lack of trust from one minute to the next. Everything means something – and it all points to Him. It occurred to me there is a great deal of connection between the truth of what Yeshua shared about the mustard seed and the law of tithing a tenth of everything we have to God. Not just of everything, but the best of everything we have. How the trust we have if even as small as a mustard seed moves mountains; that if even a tenth of what we are inside (this is the great harvest of fruit – fruits of the Spirit/Kingdom of God) stays true to the best (honesty, integrity, courage, compassion, mercy, forgiveness, love, endurance, purity) these things will carry the day and by proxy make the whole vessel move in Truth’s direction. I have lived long enough to see the truth of these principles, that originate from God, be true 100% of the time. Tithing was never meant to focus us in our money, it was meant to focus us on our worth to God. On how He provides the key instruction for our good and the good of all those around us. The Passion for Truth is not a trend or set of religious beliefs, it’s the breath of God! The Truth is a person – Yeshua Ha’ mashiach! The mustard seed of trust in the Father is as we speak moving mountains, changing landscapes, bearing fruit, – the Kingdom of God is near! Seek the meaning, the very character of God Himself in the instruction to tithe (Old Testament), and the story of the mustard seed (New Testament). I promise…there will be no doubting the results. Not compulsions to adhere to rules and religious works, but a response of joyous obedience due to the fact that freedom inside becomes more real. True freedom – from anxiety, worry, dispair, hopelessness, routine, boredom, hatred, resentment, bitterness and the stress of everyday living. It’s possible and He starts within me. Good movies are so rare these days. I recommend The Insider. It will point you to the Truth. Even though it never mentions His true name Yeshua – Salvation. There is a tithe and a seed in it. Who else can it point to but Him? For here is a truth: anything that points to truth can only be pointing to Adonai, Elohim, Yahweh,Yeshua, Jesus, the Spirit, – the One True God. Don’t confuse facts with truth. Here is what I mean. Fact: Yeshua is the Son of the Living God, the Messiah – Salvation. Truth: anyone who puts their trust in Him will be Saved. See the difference? Even the enemy (satan and the demons) know the facts and shutter! But the Truth of Him does not save them. See the truth of His character spoken in example for us with Cain and Able with the principle (direction for living) of tithing. Able brought his sacrifice (tenth) from the storehouse (within) of what is acceptable to God, the harvest of fruit from within while he was doing it on the outside. Cain, however, brought just the product gotten from the outside (the fruit on the inside was dead – choked out by comparison to his brothers work and resentment of the fact that he thought he should have had something better). How could God accept Cains sacrifice? His heart was far from the truth and focused on facts. Truth points ones heart up and with humility sends one out. Facts fall like dead weight (enslave) compared to the truth. It’s possible to be very factual and totally clueless to the Truth. Wisdom is required to produce fruit from facts. Sacrifice is required to tithe. History has proven over and over (fact) that it is harder to sacrifice what we think and feel and see (what’s inside) as “right” and exchange it for only what God says is Right. But doing nice things on the outside requires nothing – anyone can do it. Or rather,God can cause anyone to do anything. Pharaoh was caused by Yahweh to let the people go, but his heart was unchanged and he quickly used his own mind as soon as God let go of it and went back out to round them up again. Fact: God free’d His people from slavery. Truth: Yahweh is Freedom. If one is passionate for Truth, Yeshua, His Father and the Holy Spirit will be seen in everything one does. Taken into consideration about everything, consulted first, and finally submitted to in all things. Cain could have submitted to God when He corrected him. He did not and the whole of his vessel was carried away by his inner fruit. He/she who has ears…let them hear! Calamity will follow calamity, rumor will follow rumor; they will seek a vision from the prophet, but Torah (The Teachings/Instructions) will perish from the cohen (priest/shepherds) and advice from the leaders. The king will go into mourning, the prince will be clothed with fright, and the hands of the people in the land will tremble in terror. I will treat them as their way of life deserves and judge them as they have judged others. 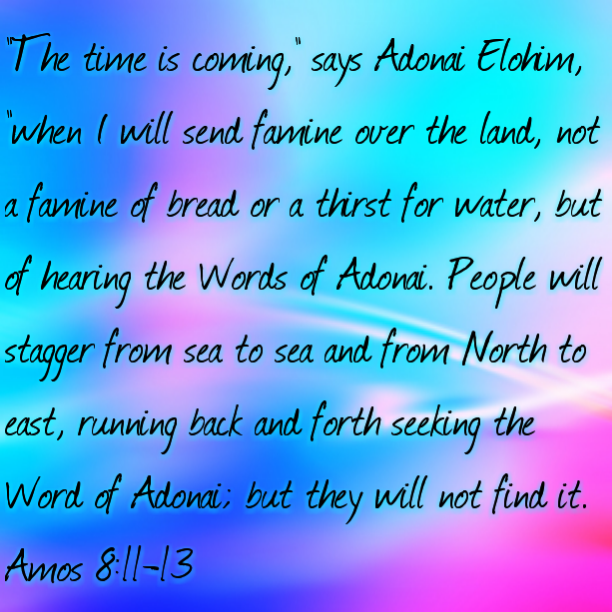 Then they will know that I Am Adonai. These are the things we are talking about when we avoid the manner of speaking that human wisdom would dictate and instead use a manner of speaking taught by the Spirit, by which we explain things of the Spirit to people who have the Spirit. Now, the natural man does not receive the things from the Spirit of God – to him they are nonsense! Moreover, he is unable to grasp them, because they are evaluated through the Spirit. But the person who has the Spirit can evaluate everything, while no one is in a position to evaluate him. …On the contrary, by making very clear what the truth is, we commend ourselves to everyone’s conscience in the sight of God. So if indeed our Good News (New Testament) is veiled, it is veiled only to those in the process of being lost. They do not come to trust because the god of the ‘olam hazeh (this world-this age) had blinded their minds in order to prevent them from seeing the light shining from the Good News (Old Testament) about the glory of the Messiah, who is the very image of God. For the time is coming when people will not have patience for sound teaching, but will cater to their passions and gather around themselves teachers who say whatever their ears itch to hear. Yes, they will stop listening to the truth, but will turn aside to follow myths. But you, remain steady in every situation, endure suffering, do the work that a proclaimer of the Good News should, and do everything your service to God requires.